Bagyong Queenie news updates as of Wednesday, November 26, 2014, as reported by state weather bureau PAGASA are available on this webpage. 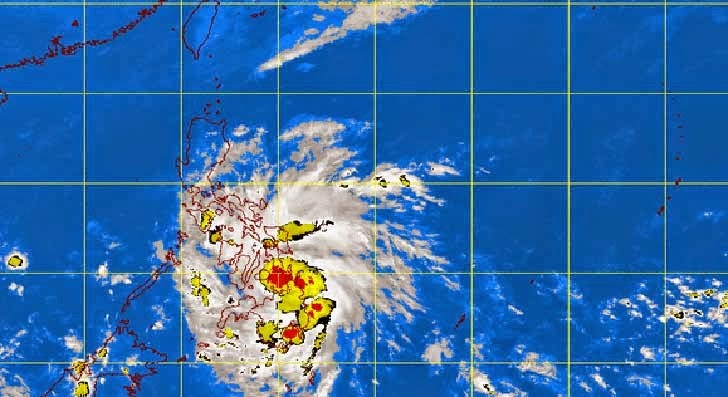 In its 5pm bulletin, the weather agency said that at 4pm, Tropical Depression Queenie was spotted at 60 kilometers East Northeast of Hinatuan, Surigao del Sur with maximum winds of 55 kilometers per hour near the center. It is forecast to move West at 24 kph. State forecasters said the regions of CARAGA, Davao, Northern Mindanao, Central Visayas and the Provinces of Southern Leyte, Zamboanga del norte, Negros Occidental and Palawan will have rains with gusty winds while the Bicol Region, the rest of Visayas and Mindanao and the Provinces of Mindoro, Marinduque and Romblon will experience cloudy skies with light to moderate rainshowers and thunderstorms. Meanwhile, Metro Manila and the rest of the country will be partly cloudy to cloudy with isolated rainshowers or thunderstorms. Moderate to strong winds blowing from the Northeast will prevail over Luzon and Visayas and from the Northeast to North over Mindanao with moderate to rough seas, PAGASA said. The estimated rainfall amount is from 7 to 15 millimeters per hour (moderate to heavy) within the 300-km diameter of Bagyong Queenie. Residents in low lying and mountainous areas in provinces as well as the rest of Mindanao are alerted against possible flashfloods and landslides. Fisherfolks and those with small seacrafts have been advised not to venture out over the seaboards of Visayas and over the northern and eastern seaboards of Mindanao, PAGASA added.